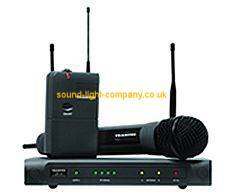 TRANTEC S4.16 SERIES UHF DIVERSITY RADIO MICROHONE SYSTEM. The new Trantec S4.16 UHF system boasts a multi-function receiver, 16 selectable frequencies and the latest PLL quartz tuning technology, making it the ultimate choice when looking for a product that will address your demands now, and into the future. The S4.16 has 16 selectable frequencies incorporating the existing 4 licence free Channel 70 frequencies, already being used in the S4.4, allowing the user to operate up to 12 frequencies together intermodulation free. The receiver has detachable antennae to allow the use of antenna distribution and remote antenna for larger sets. The S4.16 system is available in Lapel and Aerobic versions, which can be switched for use with a musical instrument, plus a Handheld with a dynamic capsule. The S4.16 has a host of additional features including LEDs on the receiver showing Power On, AF Peak level, RF Level and Diversity Channel A or B. In addition, the diversity operation receivers have rear mounted detachable antennae and variable gain jack plug & balanced XLR output. The handheld version is fitted with a dynamic capsule and the beltpack has a locking 3.5mm jack plug. The transmitter battery life is in excess of ten hours.